N. veitchii B "gold peristome"
Nepenthes veitchii can be a highlander or a lowlander depending on what plant you purchase. The plants above are of the highland variety. This plant is known for its extremely flared peristome which can be gold colored or my favorite red striped peristome in the poster Nepenthes of Sarawak. I've seen photos of many different regional varieties on the internet. Some distributors call them "a", "b", "c", etc. or Bareo Highland. What I do know is this is a slow growing plant. I've had a rooted cutting for some time that finally put out a few pitchers. The bronze colored peristome varieties do slow down for me in winter considerably for highlanders. I spoke to another grower who has good success grower the highland varieties as intermediates. They do prefer some shading and do best for me with some shade cloth to limit the intensity of sunlight. I do grow the bronze varieties in hanging baskets in full sun now that they're adjusted to their growing place. One of the highland striped pictured above arrived as a 7 year old seedling from a cross made with a highland striped parent and a solid green parent according to the grower that had the plant. He said that this was numbered #30 out of many seedlings. He also said that this particular plant was one of the best seedlings grown out because of the obvious barring. Some other seedlings didn't have as much barring as this one. So I'm excited to have this plant. This plant is quite a bit smaller than my other rooted cuttings from Exotica Plants. I was surprised at the small size for 7 years old. So I guess N. veitchii is definitely a slow grower! The Exotica Plants highland striped N. veitchii arrived as a large plant. It is absolutely phenomenal! 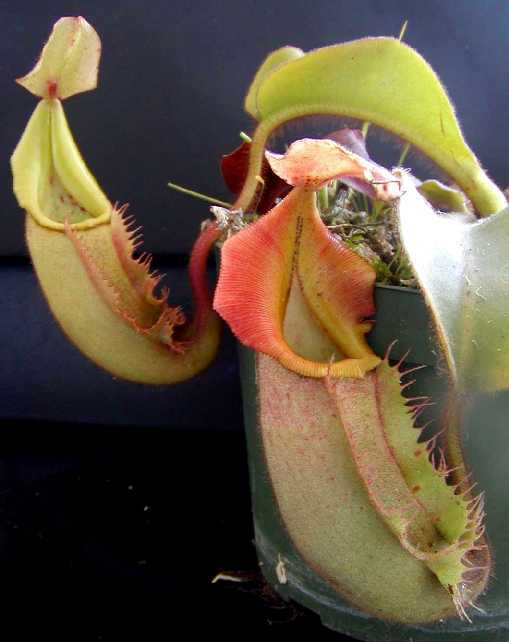 The newly opened pitchers are yellowish with the red barring. 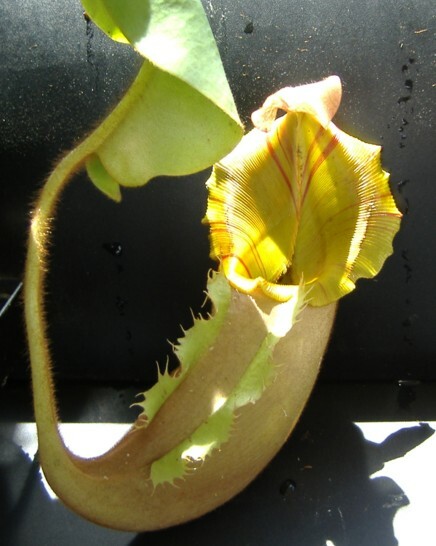 As the pitchers age, the peristome takes on a more reddish hue. To me, this is one of the best Nepenthes species available and I would rate N. veitchii highland striped as one of my top 10 plants. There are many great hybrids involving N. veitchii highland striped that are fantastic as well. It seems Exotica Plants puts out the majority of those great hybrids that I feel are all worthy of adding to any collection.